Do you like Brussels Sprouts? Or do you not like them but know someone who does? Ditch the boring boiled or steamed sprouts and try roasting them instead! I personally like them just about any way that they are prepared but my husband is less than enthusiastic about this vegetable. I asked a few friends how they liked to cook Brussels sprouts and this was the result. Most recommended roasting, some with other veggies or herbs so feel free to experiment with what your family likes. When I made the sprouts in this manner, my husband loved them and even went back for seconds. This is a great recipe to try with picky kids too, the bacon really helps flavor the vegetable all around. 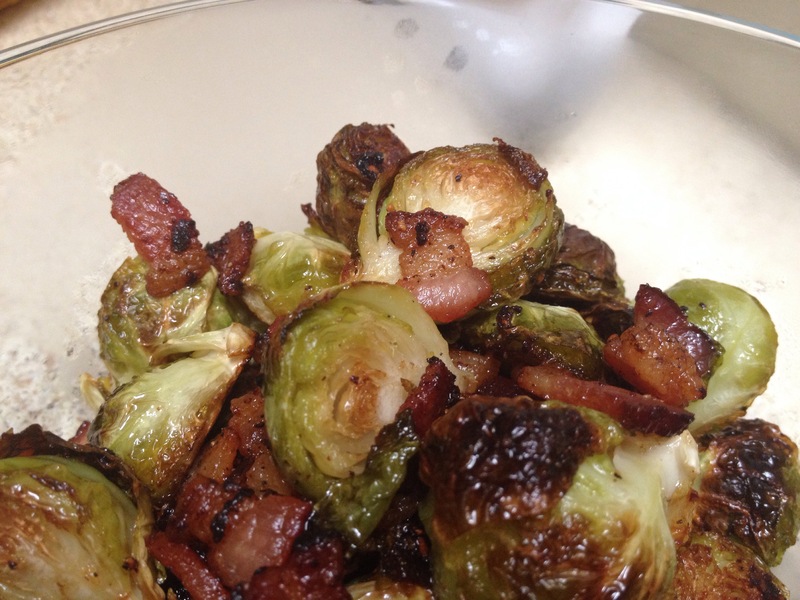 Toss sprouts, bacon pieces, salt, pepper and garlic in a bowl and drizzle with oil of choice. You do not need tons of oil because the bacon will render down and provide extra fat, this is just to prevent sticking. Spread them out on a sheet pan and roast for 20-25 mins until browning occurs on cut side and bacon is rendered down nicely.